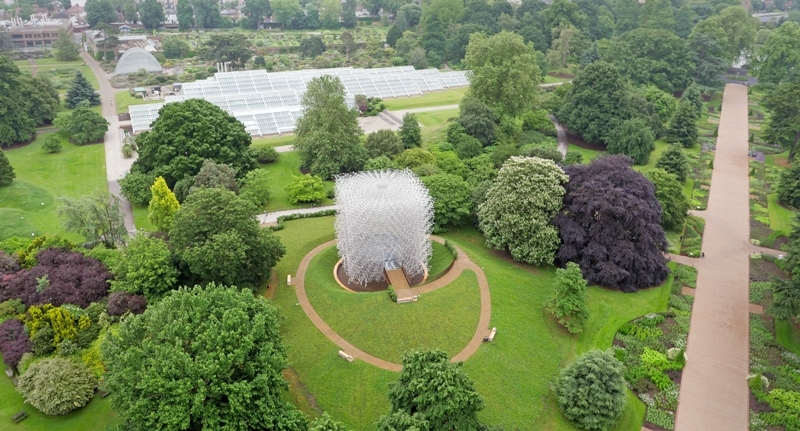 Following the success of the UK Pavilion at Milan Expo 2015, the UKTI and Royal Botanic Gardens, Kew reached an agreement for the main sculptural piece of the pavilion, the Hive, to be relocated to Kew Gardens for a period of two years. An important element of the landscape design was to provide a setting for the Hive that would have a meaningful and functional legacy once the sculpture has been moved after two years at Kew Gardens. The landscape needed to provide Kew with an event space to hold external classes and talks, set within a landscape typology unique within Kew. As the meadow develops and various plant species come into flower, the sounds and sights of bees within The Hive will be accompanied by real bees within the meadow, creating a multi-layered, multi-sensory experience. To relocate the Hive from Milan to Kew as a cost effective, yet visually stunning, temporary installation that delivers the strong message of the decline of the world’s bee population. The installation will form part of a wider strategic approach by Kew to enhance its educational and scientific research offer. The experience of the Hive at Kew Gardens is visual, audible and can also be experienced through vibration using bone conductors below the Hive. The Hive itself is intrinsically linked to a real beehive within Kew gardens. An accelerometer (vibration sensor) registers movements of the bees within the beehive, which feeds live signals to 1000 LED luminaires within the Hive sculpture. The visual experience is enhanced by a soundscape in the Hive and the surrounding landscape, based around pre-recorded bee sounds and accompanying music. sounds and sights will be accompanied by real bees within the meadow, creating a multi-layered, multi-sensory experience. Hard surfacing throughout the installation is formed using bound stone and recycled car tyre rubber. This creates a sustainable and fully permeable surfacing solution which allowed us to drain the scheme without any visible drainage points. The scheme design required a steep embankment to be formed to accommodate level change and envelop the Hive. A bespoke retaining solution was developed to allow the planting to establish and thrive to ensure the design concept of the meadow continued throughout. but also create a beautiful setting for the Hive sculpture throughout all seasons. Due to the relatively short timescales associated with the project and the public use of Kew Gardens, it was imperative that the wildflower meadow should be established when the installation opened in June 2016. To achieve this display, Wildflower Turf were commissioned to grow the wildflower meadow on to be lifted in May, in the same way that general turf is used. This allowed the Hive structure and associated groundworks to be completed prior to installation of the meadow, which was laid in a semi-established state within two weeks of construction completion. 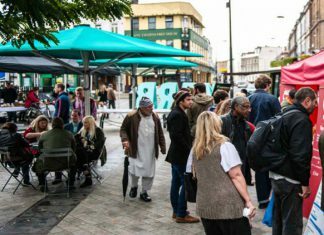 Design and delivery of a new public space / street market.